HMS Eagle, Bulwark, and Albion of the Royal Navy. Major political defeat for Britain. The Suez Crisis (known as the Suez War or 1956 War, commonly known in the Arab world as the Tripartite aggression; other names include the Sinai war, Suez-Sinai war, 1956 Arab-Israeli War, the Second Arab-Israeli War, Suez Campaign, Sinai Campaign, Kadesh Operation, and Operation Musketeer) (Arabic: أزمة السويس - العدوان الثلاثي Hebrew: מבצע קדש) was a war fought on Egyptian territory in 1956. The conflict pitted Egypt against Israel, the United Kingdom, and France. The Suez Canal had been important in Iran and the colonial penetration of Africa, and had been vital in maintaining control of India. For this reason, colonial powers considered it vital to keep the canal out of Egyptian control. Thus in 1875, Isma'il Pasha was forced to sell his country's share in the canal to the United Kingdom, and the Convention of Constantinople (1888) declared the canal a neutral zone under British "protection." The Anglo-Egyptian Treaty of 1936 gave the United Kingdom control over the canal. However, in 1951 Egypt repudiated this treaty, and by 1954 the United Kingdom had agreed to pull out. Britain objected strongly when the Egyptian leader, Gamal Abdel Nasser, nationalized the Suez Canal Company, which operated the Suez Canal. By this stage, two-thirds of Europe's oil was being imported via the canal. Britain purported to fear an Israeli attack on Egypt, and sought cooperation with the United States throughout 1956 to deal with this, to little effect. The alliance between the United Kingdom, France, and Israel was largely one of convenience; the European nations had economic and trading interests in the Suez Canal, while Israel wanted to reopen the canal for Israeli shipping and end Egyptian-supported fedayeen incursions and hit-and-run raids. When the Soviet Union threatened to intervene on behalf of Egypt, Canadian Secretary of State for External Affairs Lester B. Pearson feared a larger war and proposed a plan to separate the opposing forces by placing United Nations forces between them to act as a buffer zone or "human shield." (Pearson later won a Nobel Peace Prize for his role in ending the conflict). Eventually, pressure from the United States forced Britain, France, and Israel to withdraw. The crisis resulted in the resignation of the British Conservative prime minister, Sir Anthony Eden, marked the completion of the shift in the global balance of power from European powers to the United States and the USSR, and was a milestone in the decline of the British Empire. The Suez Canal was opened in 1869, having been financed by France and the Egyptian government. Technically, the territory of the canal itself was sovereign Egyptian territory, and the operating company, the Universal Company of the Suez Maritime Canal (Suez Canal Company) was an Egyptian-chartered one (originally as part of the Ottoman Turkish Empire). In 1875, the British government of Benjamin Disraeli bought out the Egyptian share of the company, giving it partial control over the canal's operations, which it shared with mostly French private investors. In 1882, during foreign intervention in Egypt, the United Kingdom took de facto control of the canal itself. The canal was of strategic importance, being the ocean trade link between Britain and its colonies in India, the Far East, as well as Australia and New Zealand. The area as a whole was strategic to North Africa and the Middle East. The importance of the canal as a strategic center was apparent during both World Wars. During the First World War, the British and French closed the canal to non-Allied shipping. During the Second World War, it was tenaciously defended during the North African Campaign. [I]n 1948, the canal abruptly lost its traditional rationale. India had become independent the year before and so control over the canal could no longer be preserved on grounds that it was critical to the defense either of India or of an empire that was being liquidated. And yet, at exactly the same moment, the canal was gaining a new role—as the highway not of empire, but of oil. The Suez Canal was the way most of the growing volumes of Persian Gulf oil got to Europe, cutting the 11,000 nautical mile (20 000 km) journey around the Cape of Good Hope to Southampton down to 6,500 nautical miles (12 000 km). By 1955, petroleum accounted for two thirds of the canal's traffic, and in turn two thirds of Europe's oil passed through it. Flanked to the north by Tapline and the Iraq Petroleum Company pipelines, the canal was the critical link in the postwar structure of the international oil industry. British troops were withdrawn from Palestine in 1947 and the state of Israel was formally established in 1948, shortly followed by the 1948 Arab-Israeli War, which further established both Israel's independence and Arab-Israeli enmity. In 1952, officers in the Egyptian army overthrew the monarchy of King Farouk, who had been a close ally of the British. The new government abandoned policies friendly to the European powers, while at the same time asserting an independent and Arab nationalist identity. Egypt has decided to dispatch her heroes, the disciples of pharaoh and the sons of Islam and they will cleanse the Land of Israel…. There will be no peace on Israel's border because we demand vengeance, and vengeance is Israel's death. Meanwhile, the Gaza Strip—a part of the former British mandate, now occupied by Egypt—became a haven for masses of Palestinian refugees and a hotbed for guerrilla activity against the fledgling Jewish state. In response, from 1953–1956 the Israel Defense Forces (IDF) launched a number of strikes. These attacks were assisted by the future prime minister of Israel, Ariel Sharon, who interrupted his studies at the Hebrew University of Jerusalem to become the military leader of the first special forces unit of the IDF: The elite Unit 101. This policy of reprisals was a major source of internal dispute between hawks, led by David Ben-Gurion, and doves, led by his successor for a short time, Moshe Sharett. It sometimes led to strong external criticism from the United Nations and even Israel's supporters. The Gaza raid on February 28, 1955, marked yet another turning point in relations between the two enemies. In retaliation, Egypt began to sponsor official Fedayeen and commando raids on Israel, sometimes through the territory of Jordan, which officially opposed these raids, while still publicly discouraging Palestinian infiltration. There were secret talks, through various intermediaries and methods, between Egypt and Israel, but the escalating tensions between the IDF and the Fedayeen put an end to them. Throughout 1956, tensions increased between Israel and Egypt, with Egyptian fedayeen launching frequent incursions into Israeli territory and Israel launching retaliatory raids into Egyptian territory. On July 26, 1956, Egypt, under the leadership of President Gamal Abdel Nasser announced the nationalization of the Suez Canal Company, which operated the vital trade route to the east, and in which British banks and business held a 44 percent stake. This nationalization was done in order to raise revenue for the construction of the Aswan High Dam on the Nile River. Concerning the Aswan High Dam project, the United States and Britain had previously agreed to help pay for this project, but canceled their support after Egypt bought tanks from communist Czechoslovakia, then part of the Soviet bloc, and extended diplomatic recognition to the People's Republic of China. The improved Egyptian relationship with the Chinese was the result of the Bandung Conference in 1955, where Nasser had asked the Chinese to use their influence on the Soviets to supply Egypt with the necessary arms. The British Prime Minister of the time, Sir Anthony Eden, tried to persuade the British public of the need for war and so, perhaps in an attempt to recall World War II-era patriotism, he compared Nasser's nationalization of the Suez Canal with the nationalism of Benito Mussolini and Adolf Hitler twenty years earlier. However, it is interesting to note that the very first comparisons between 1930s dictators and Nasser during the crisis was made by the opposition Labour leader, Hugh Gaitskell and the left-leaning tabloid newspaper, the Daily Mirror. Eden had been a staunch opponent of Neville Chamberlain's policy of appeasement and he claimed that a display of force was needed to prevent Nasser from becoming another expansionist military threat. Eden had also been exercised over Nasser's apparent role in the dismissal of British military leader Glubb Pasha in Jordan prior to the canal company nationalization. The French in turn were hostile because of Nasser's support for insurgents in Algeria. Between July and October 1956, unsuccessful initiatives encouraged by the United States were made to reduce the tensions that would ultimately lead to war. International conferences were organized to secure agreement on canal operations; no agreement was secured. In the months that followed Egypt's nationalization of the canal company, with the support of the former managers of the company that operated the canal, Compagnie universelle du canal maritime de Suez, a secret meeting between Israel, France, and Britain took place at Sèvres, outside Paris. Details on the Protocol of Sèvres emerged only years later, as records of the meeting were suppressed and destroyed. All parties agreed that Israel should invade and that Britain and France would subsequently intervene, instruct the Israeli and Egyptian armies to withdraw their forces to a distance of ten miles (16 km) from either side of the canal, and then place an Anglo-French intervention force in the Canal Zone around Port Said. It was to be called "Operation Musketeer". 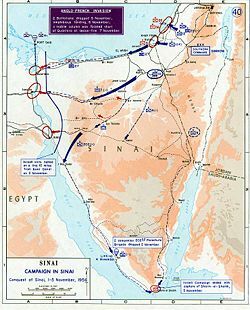 On October 29, 1956, Israel invaded the Egyptian-controlled Gaza Strip and Sinai Peninsula and made rapid progress towards the Canal Zone. As per the agreement, Britain and France offered to reoccupy the area and separate the warring armies. Nasser (whose nationalization of the company had been greeted with joy by the Egyptian public) refused the offer, which gave the European powers a pretext for a joint invasion to regain control of the canal and topple the Nasser regime. To support the invasion, large air forces had been deployed to Cyprus and Malta by the UK and France and many aircraft carriers were deployed. The two airbases on Cyprus were so congested that a third field, which was in dubious condition, had to be opened for French aircraft. Even RAF Luqa on Malta was extremely crowded with RAF Bomber Command aircraft. 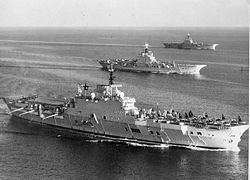 The UK deployed the aircraft carriers HMS Eagle, Albion, and Bulwark and France had the Arromanches and Lafayette on station. In addition, HMS Ocean and Theseus acted as jumping-off points for Britain's helicopter-borne assault (the world's first). Meanwhile the Israel Border Police militarized the Israel-Jordan border (including the Green Line with the West Bank) which resulted in the killing of 48 Arab-Israeli civilians by Israeli forces on October 29 (known as the Kafr Qasim massacre). The United Kingdom and France initiated Operation Musketeer on October 31, with a bombing campaign. Nasser responded by sinking all 40 ships present in the canal, closing it to further shipping until early 1957. On late November 5, the 3rd Battalion of the Parachute Regiment dropped at El Gamil Airfield, clearing the area and establishing a secure base for incoming support aircraft and reinforcements. At first light on November 6, Commandos of Nos 42 and 40 Commando Royal Marines stormed the beaches, using landing craft of WWII vintage. Salvos from the battle group standing offshore opened fire, giving covering fire for the landings and causing considerable damage to the Egyptian batteries and gun emplacements. The town of Port Said sustained great damage and was seen to be alight. Acting in concert with British forces, 500 heavily-armed paratroopers of the French 2ème RPC (Régiment Parachutiste Colonial), hastily redeployed from combat in Algeria, jumped over the al-Raswa bridges from Nordatlas transports of the ET (Escadrille de Transport) 1/61 and ET 3/61, together with some combat engineers of the Guards Independent Parachute Company. Despite the loss of two soldiers, the western bridge was swiftly secured by the paras, and Corsairs of the Aéronavale 14F and 15F flew a series of close-air-support missions, destroying several SU-100s. F-84Fs also hit two large oil storage tanks in Port Said, which went up in flames and covered most of the city in a thick cloud of smoke for the next several days. Egyptian resistance varied, with some positions fighting back until destroyed, while others were abandoned with little resistance. In the afternoon, 522 additional French paras of the 1re REP ([Régiment Étranger Parachutiste, Foreign Legion 1st Para Regiment) were dropped near Port Fuad. These were also constantly supported by the Corsairs of the French Aéronavale, which flew very intensive operations: For example, although the French carrier LaFayette developed catapult problems, no less than 40 combat sorties were completed. In total, 10 French soldiers were killed and 30 injured during the landing and the subsequent battles. British commandos of No. 45 Commando assaulted by helicopter, meeting stiff resistance, with shore batteries striking several helicopters, while friendly fire from British carrier-borne aircraft caused heavy casualties to 45 Commando and HQ. Street fighting and house clearing, with strong opposition from well-entrenched Egyptian sniper positions, caused further casualties. The operation to take the canal was highly successful from a military point of view, but a political disaster due to external forces. Along with Suez, the United States was also dealing with the near-simultaneous Soviet-Hungary crisis, and faced the public relations embarrassment of criticizing the Soviet Union's military intervention there while at the same time avoiding criticism of its two principal European allies' actions. Perhaps more significantly, the United States also feared a wider war after the Soviet Union threatened to intervene on the Egyptian side and launch attacks by "all types of weapons of destruction" on London and Paris. Thus, the Eisenhower administration forced a cease-fire on Britain and France, which it had previously told the Allies it would not do. Part of the pressure that the United States used against Britain was financial, as President Eisenhower threatened to sell the United States reserves of the British pound and thereby precipitate a collapse of the British currency. After Saudi Arabia started an oil embargo against Britain and France, the U.S. refused to fill the gap, until Britain and France agreed to a rapid withdrawal. There was also a measure of discouragement for Britain in the rebuke by the Commonwealth Prime Ministers St. Laurent of Canada and Menzies of Australia at a time when Britain was still continuing to regard the Commonwealth as an entity of importance as the residue of the British Empire and as an automatic supporter in its effort to remain a world power. The British government and the pound thus both came under pressure. Eden was forced to resign and the French and British forces had finished withdrawing by December 1956; the Israelis did in March 1957. Before the withdrawal, Lester Pearson, Canada's acting cabinet minister for external affairs, had gone to the United Nations and suggested creating a United Nations Emergency Force (UNEF) in the Suez to "keep the borders at peace while a political settlement is being worked out." The United Nations accepted this suggestion, and after several days of tense diplomacy, a neutral force not involving the United States, Britain, France, or most of the Soviet Bloc was sent with the consent of Nasser, stabilizing conditions in the area. Pearson was awarded the Nobel Peace Prize in 1957 for his efforts. The United Nations Peacekeeping Force was Lester Pearson's creation and he is considered the father of the modern concept "peacekeeping." Eden's resignation marked, until the Falklands War, the last significant attempt Britain made to impose its military will abroad without U.S. support. However, Nigel Ashton argues "that British strategy in the region changed very little in the wake of Suez. Macmillan was every bit as determined as Eden had been to stop Nasser," although he was more willing to enlist American support in the future for that end. Some would argue that the crisis also marked the final transfer of power to the new superpowers, the United States and the Soviet Union. The incident demonstrated the weakness of the NATO alliance in its lack of planning and cooperation outside the European theater. From the point of view of General de Gaulle, the Suez events demonstrated that France could not rely on allies, especially the United States, when pursuing its own foreign policy goals. This eventually led to de Gaulle's withdrawal of France from the integrated NATO military command. The imposed end to the crisis signaled the weakening of the United Kingdom and France as Global Powers. Nasser's standing in the Arab world was greatly improved, with his stance helping to promote pan-Arabism and reinforce hostility against Israel and the West. The crisis also arguably hastened the process of decolonization, as the remaining colonies of both Britain and France gained independence over the next several years. By early 1957, all Israeli troops had withdrawn from the Sinai. As part of the deal, the United Nations Emergency Force (UNEF) was placed in the Sinai (on Egyptian territory only) with the express purpose of maintaining the cease-fire. While effective in preventing the small-scale warfare that prevailed before 1956 and after 1967, budgetary cutbacks and changing needs had seen the force shrink to 3,378 by 1967. The Egyptian government then began to remilitarize the Sinai, and demanded that the UNEF withdraw. This action, along with the blockade of the Strait of Tiran, led directly to the Six Day War. During the war, Israeli armed forces captured the east bank of the canal, which subsequently became a de facto boundary between Egypt and Israel and the canal was therefore closed until June, 1975. Eisenhower later admitted, after retiring from office, that the Suez Crisis was perhaps the biggest mistake he made in terms of foreign policy. Not only did he feel that the United States weakened two crucial European Cold War allies but he created in Nasser a man capable of dominating the Arab world. Leuliette, Pierre. St. Michael and the Dragon: Memoirs of a Paratrooper. Boston, MA: Houghton Mifflin, 1964. July 2006, BBC, Suez 50 years on. July 2006, The Economist, An affair to remember. Suez and the high tide of Arab nationalism. International Socialism 112 (2006). This page was last modified on 24 October 2015, at 14:47.